Combined two spaces to create large kitchen area with all new cabinets, finishes, appliances, and lighting. They did not want the integrity of the exterior design disrupted. They wanted the remodeled kitchen area to appear light and open. 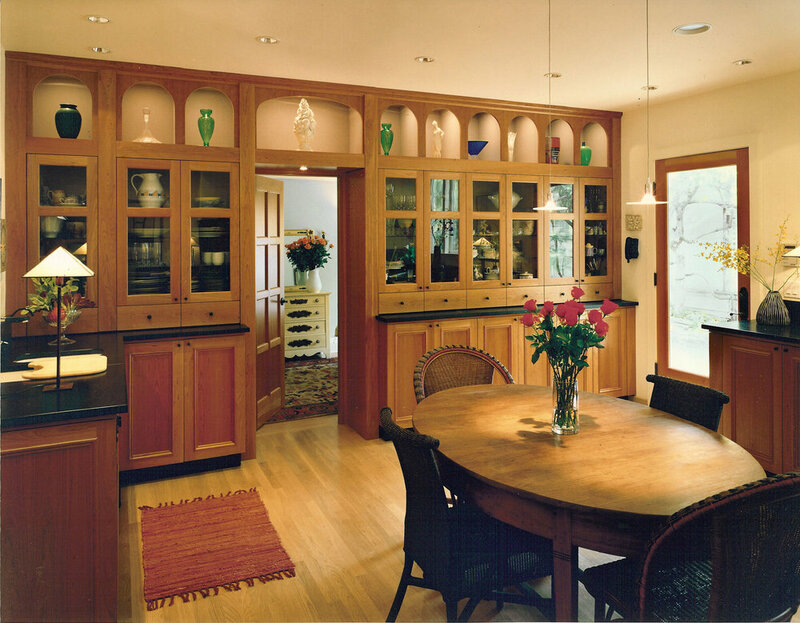 The owner was an artist and wanted the cabinets to allow for display of some artwork. 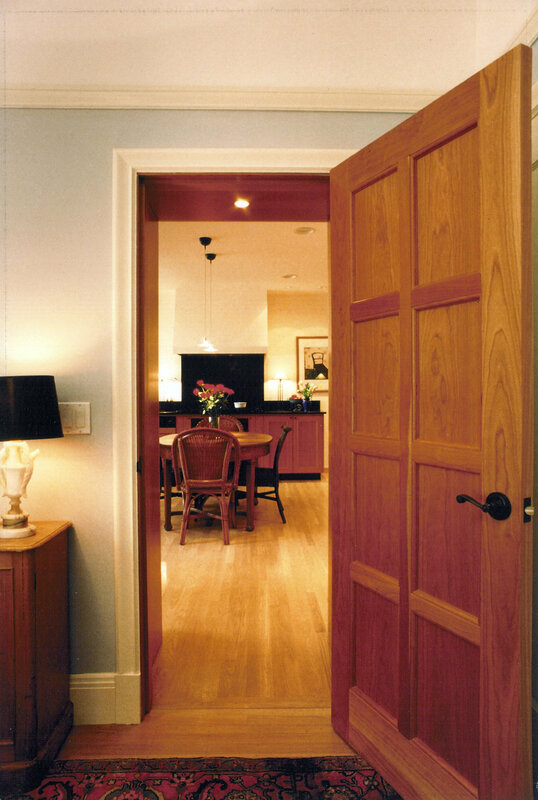 A transition was needed between the remodeled kitchen and adjacent guest bedroom. 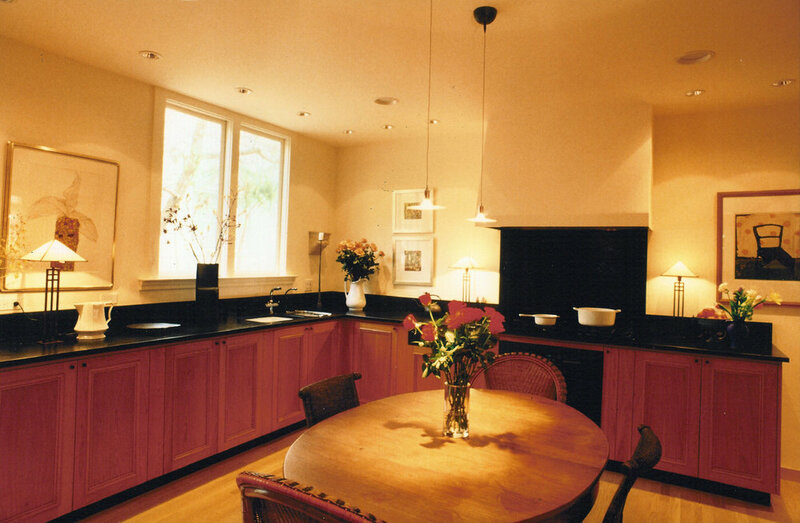 The owner wanted a large kitchen that would be suitable for entertaining large dinner parties but at the same time be a warm and inviting center for everyday household activities. We combined the kitchen and adjacent utility room into one large renovated kitchen area. Leaving the existing windows intact, we replaced an existing exterior door with a new glass door to let in more light. We kept the wall finishes as light as possible and introduced artificial light fixtures for task lighting and dramatic effect. The owners wanted to eliminate all upper cabinets for the artwork display, so we convinced them to create a “wall” of custom cabinets at one end of the kitchen. This provided the storage lost from the absent upper cabinets, and also created a small buffer between the renovated kitchen and the adjacent guest room, which is accessed through the kitchen. The remodeled kitchen style is significantly more compatible with the existing residence and is a warm and inviting space that is both functional and beautiful. The dining table in the center of the kitchen serves many functions: a place to prepare food, eat, do homework and home projects. The two dishwashers and two sinks along with the abundant counter space are suitable for large-scale entertaining or small household activities. 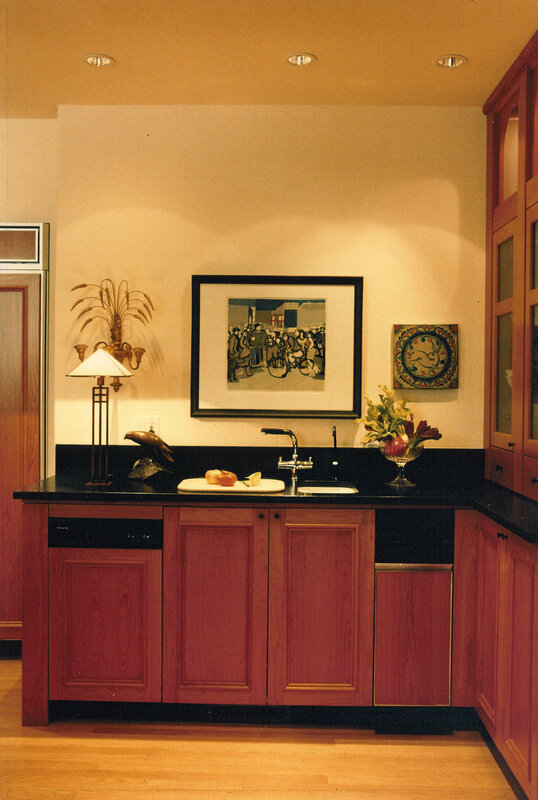 The areas left open above the cabinets and plentiful wall space allows ample room for the owner’s artwork.